Burgers don’t always have to be “standard”. 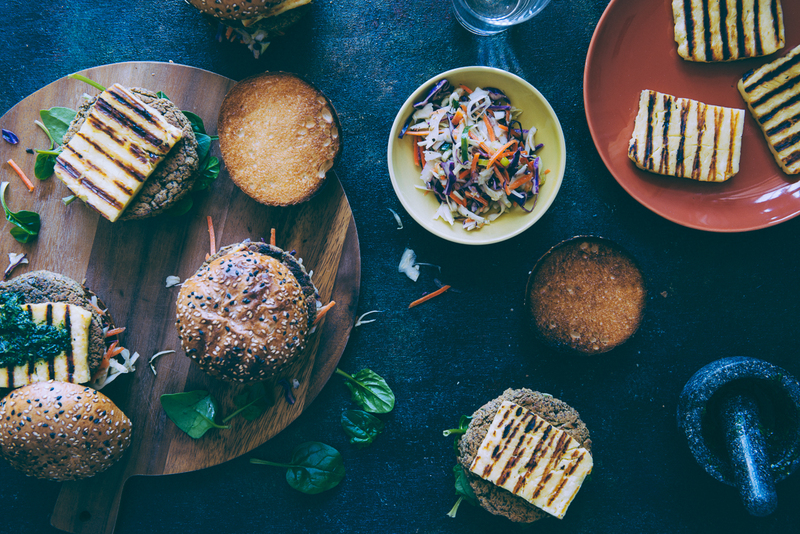 Change it up a little – try these chickpea and quinoa burgers wth halloumi. Just a little update to let you know I haven’t disappeared completely. I’ve been on vacation and have just returned after three glorious weeks away. My holiday included exploring parts of Brittany, Paris, Rome and ten days exploring Sicily. I did intend to blog whilst I was away but you know, it’s sort of hard to sit in front of a computer when you have the sweeping cliff top views of Taormina staring right back at you! Anyway, I’m back and I’m currently editing what feels like a million images. I’ll be showcasing parts of my holiday in a blog post some time next week. In the mean time let’s get cooking with these tasty chickpea and quinoa burgers made with halloumi. I don’t think I’ve ever met a burger I didn’t like. It all started in Melbourne in my childhood years where I would head to the local fish and chip shop and order a “burger with the lot” as we say here in Australia. These burgers were nothing like the American burgers I would see being ordered on 70’s shows like Happy Days or the Brady Bunch. It was usually a big white toasted flat bun spread with margarine. And in between that would be a grilled mince patty, lettuce, tomato and fried onions. And let’s not forget the tomato sauce. Personally, I never really did do the beetroot thing. But things are a little different now. Much different. As much as I adore making the Greek version of burgers a.k.a biftekia, I can’t help but experiment with different ingredients and ideas. Changing the concept around can be fun. In case you’re interested I’ve have a number burger recipes on the blog which include salmon burgers, lamb burgers and even a portobello mushroom and halloumi burger. When I presented theses chickpea and quinoa burgers to a bunch of friends the other night for research purposes, I was met with the usual groans and moans about veggie burgers and cardboard. But I had a secret weapon up my sleeve. Halloumi. It always makes things taste better! I baked my patties in the oven, topped them with a piece of grilled halloumi, threw on some coriander relish and sandwiched it between a brioche bun. Admittedly, the patties did crumble a bit but it was nothing major. Add your own salad ingredients (I used baby spinach leaves and coleslaw) top with your own sauce (a pesto would be great too) and say hello to a new type of burger. If you're after something a little different, then I urge you to make these chickpea and quinoa burgers. And don't forget the secrete topping - halloumi. Adapted slightly from here. Cook the dried quinoa according to package instructions and set aside. Combine the chickpeas, cumin, herbs, olive oil, molasses, egg and seasoning in a food processor and process until combined. Transfer this mixture to a bowl and add in the cooked quinoa and combine. Shape into six patties measuring approx. 8-9cm in diameter. Place the patties on the baking tray and cook for 30 mins. ensuring to turn them over halfway. Construct the burgers with your choice of salad on the bottom, followed by the chickpea and quinoa burger, grilled halloumi and relish.